The fuel-filler lid may be opened from inside the vehicle by pulling up on the fuel-filler lid opener located on the front floor area on the left side of the vehicle. o Gasoline vapors are dangerous. Before refueling, always stop the engine and never smoke or allow sparks and open flames near the filler area. o Never operate your vehicle without a filler cap properly installed, flammable vapors and gasoline could leak out in dangerous situations such as a collision or rollover. If the filler cap must be replaced, only use genuine Hyundai replacement parts. 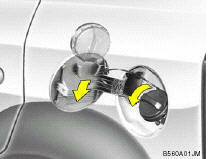 o After refueling, make sure the fuel cap is installed securely to prevent fuel spillage in the event of an accident. o If you open the fuel filler cap during high ambient temperatures, a slight "pressure sound" may be heard. This is normal and not a cause for concern. Whenever you open the fuel filler cap, turn it slowly. o Do not "top-off" after the nozzle automatically shuts off when refueling. o Automotive fuels are flammable/explosive materials. When refueling, please note the following guidelines carefully. - Before touching the fuel nozzle or fuel filler cap, have one's hands in contact with metal parts away from the filler neck to discharge static electricity. 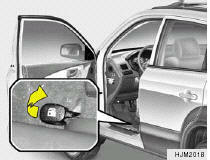 - Do not get back in the vehicle while refueling. Do not operate anything that can produce static electricity. Static electricity discharge can ignite fuel vapors resulting in explosion. - When using a portable fuel container be sure to place the container on the ground while refueling. Static electricity discharge from the container can ignite fuel vapors causing a fire. While starting refueling contact should be maintained until the filling is complete. - Do not use cellular phones around a gas station. The electric current or electronic interference from cellular phones can ignite fuel vapors causing a fire. - When refueling always shut the engine off. Sparks by electrical equipment of the engine can ignite fuel vapors causing a fire. After refueling, check to make sure the fuel filler cap is securely closed, and then start the engine. - Do not smoke or try to light cigarettes around a gas station. Automotive fuels are flammable.